I don’t know about you but I have a very bad habit. Actually, I probably have many very bad habits but there’s only one that’s pertinent to this post. You see, whenever I visit someone’s house, I don’t just check out their bookshelves, I pretty much go through them in detail to see what they read. I’ve even been known to stand there with my head cocked on one side, reading book spines while my host or another guest is talking to me, which never fails to irritate Mrs Falaise. I suppose it’s another attraction of blogging and reading other blogs, that you get to see what other people have on their virtual shelves. I hope you recognise at least a little bit of you in that last paragraph and that I am not freakishly alone in this quirk. 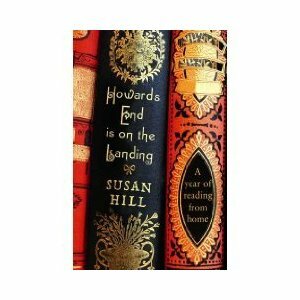 If you do, you, like me, will probably enjoy Howard’s End is on the Landing by Susan Hill, the noted author, critic and publisher. Ms Hill spent a year reading only books she already had in the house she shares with her husband, Shakespeare scholar Stanley Wells, and her family in Gloucestershire and has turned that year into a part-description of that year, a part-memoir and a part-essay on her favourite books. Her range is extensive and eclectic, covering everything from the likes of Dickens, Hardy and Trollope to lighter fare such as Fleming, Sayers and Wodehouse and, for a member of Britain’s literary establishment, she has refreshingly non-elitist views on reading materials. This all makes for a fascinating and entertaining tour of her book collection. She is, of course, helped by the fact that she lives in a large farmhouse with plenty of room for books and that, as one half of a bookish couple, there are no tensions over book storage (her husband even has an entire room dedicated to Shakespeare scholarship). For anyone with limited storage space, this book is likely to rouse the green monster of jealousy repeatedly. This will not be the only cause of envy arising from Howard’s End is on the Landing. Susan Hill had her first novel published even before she started at university and was quickly taken up by London literary circles in the late 1960s. As a result, she has known or met many of the most famous authors of the late 20th Century. The memoir side of the book is replete with tales of how she bumped into E.M. Forster in the London Library as an undergraduate or how she was humiliated by Edith Sitwell or how she met Ian Fleming at a party. Frankly, if you have ever harboured ambitions of writing, parts of this book will make you wish to be able to swap lives with Ms Hill. In truth, the name dropping would be a little boastful or pretentious if it weren’t for the fact that the literary world is so clearly her milieu. It is a natural place for her and it is authors and academics who people her world. Once you accept this, it is easier to enjoy the linkage between some of her favourite works and her friends and colleagues. She also has a number of opinions from which I differ. She sees no point in e-readers which, as you will appreciate if you read my post on the subject, is definitely not something with which I agree (although I do have some sympathy with her viewpoint) and I find it slightly amusing that this book is now available in a Kindle version. I am also at odds with her on the subject of P.G. Wodehouse’s short stories. She believes that his style, “ambling up to a novel, taking the scenic route”, doesn’t work. I believe that many of his short stories are mini-masterpieces although I accept that the best are linked chronologically in the books in which they appear. On the whole, though, I find myself pleasingly in agreement with her. Our views on Sayers, le Carré, Fleming and Wodehouse’s novels coincide and neither of us is fond of Austen. If all this weren’t enough to pique your interest, she even includes as a mini-theme, the picking of a list of the 40 books she would choose if she could only have 40 books to last the rest of her life. It seems to me that many bloggers, maybe even most book bloggers, love lists of books and so this must be the cherry on the top of this particular cake. I thoroughly enjoyed this book and the highest praise I can give it is that, having read it, I would love to be able to spend an afternoon pottering about in her house examining her shelves and then to sit down for a cup of tea with her to hear more reminiscences. I suspect we are not alone in that. I think you would love this book. This book is already on my wishlist! I do the samething when I visit someone, I always want to know what people are reading. Sharon - it's a great book.